Use this 5/8" perma-loc tape x 420 barb adapter to connect drip tape to a PVC mainline. Valve fitting has easy to use on/off functionality. 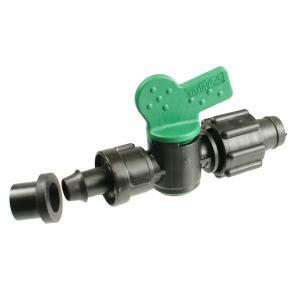 Note: This fitting is designed to be used with 1.5" or greater PVC pipe. Use a 5/8" (16mm ) size drill bit to create proper hole in PVC pipe, insert the rubber grommet and barbed end of fitting.